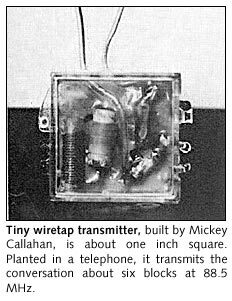 Just how far have we really come, technically speaking, since master bug builder Manny Mittleman stuffed that tiny eavesdropping transmitter inside a plastic martini olive back in 1966? 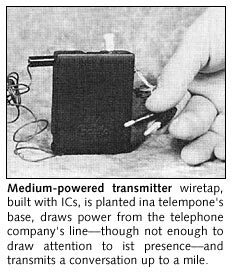 The toothpick was the antenna, you will recall, and the little transmitter, submerged in two inches of watered-down gin, don't forget, was supposed to broadcast your conversation to a disguised enemy sitting somewhere with a receiver. The whole thing made a big publicity splash. 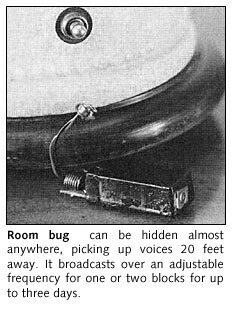 Life Magazine did a cover story on all kinds of eavesdropping devices and personalities, and electronic bugs were soon literally crawling out of the showroom windows on New York's 42nd St., and on its local equivalents across the land. Eavesdropping was suddenly the hottest thing around -- hot in the sense that it was popular. In 1968 it became hot because it was outlawed, and several old pros went to jail. Passage of the Omnibus Crime and Safe Streets Act in 1968 banned bugging except by law enforcement officers with court orders. Who could legally make the devices even for the law was never really cleared up. But people making them exclusively for government agencies were not locked up. But now bugging has emerged once more as a major issue, thanks to Watergate. It's still illegal, but very active. And it has been all along. What has been achieved as far as the state of the art is concerned? TV's Mission Impossible has kept us somewhat up to date on advances such as bumper beepers for cars that tell a direction finder where the car is. But what about things like those lasers that use a distant window pane as a sensitive diaphragm to capture the conversation inside a room? Do they exist? Alfred J. Scotti, Chief Assistant District Attorney and head of New York's Rackets Bureau, says the bureau ran into one such a device "a couple of years ago" but he wasn't saying where, whose or anything else about it. A leading laser manufacturer queried on the matter made it clear that eavesdropping wasn't his or his company's bag but that, of course, such a thing could be done. "An infrared laser could be beamed against a window to pick up the window pane's movements caused by the acoustic waves created by people talking inside. Then using another laser beam as a reference you'd get a beat frequency. This could be demodulated to reveal the conversation." This technique, he explains, is used in acoustic holography to measure very small motions. There are, of course, any number of expensive military devices that everyone knows about that could be used if one had the money: light intensification devices, low-light-level television, infrared binoculars and even people sniffers. But those things are too expensive for anyone but the government. The real action is still with telephone taps and bugs. And progress has been made with these. Despite claims by surveillance equipment designers that sophistication is not necessary, they have done some interesting things. Details are hard to extract because many talented designers don't like to talk. Many of them, of course, are making products that are illegal, or marginally so, an aspect that generally dampens the desire for publicity. And also, competition is fierce. Manufacturers are not only reluctant to discuss new innovations, they usually pot their circuits so competitors will tear them into unreadable pieces if they try to study the secrets inside. 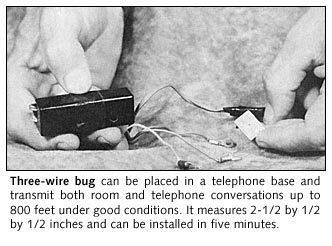 One manufacturer recalls once receiving an urgent order from a mail order house for a debugging device to be delivered as soon as possible. A mail order house doesn't manufacture; it buys from manufacturers and sells by mail for a considerable markup. To comply with the request for speed he decided to forego potting and sent it on. Several months later he ran across a brochure from the company showing a device surprisingly similar to the one he had sold them. He ordered it, under an assumed name, and sure enough it was a fairly good copy of his own design. But despite security wraps improvements are known to have been made with bugs and telephone taps. 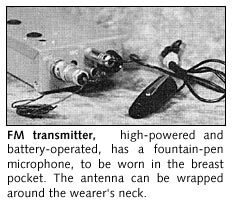 A bug, as you will remember, is a device that consists of a microphone, a transistor and an antenna. 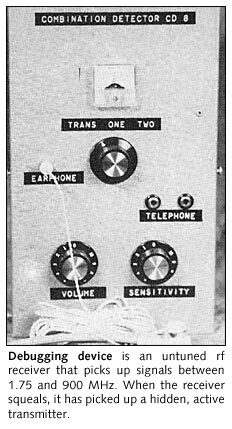 Telephone taps are wires or circuits to intercept a telephone conversation or use the telephone to listen in on a conversation in the room. 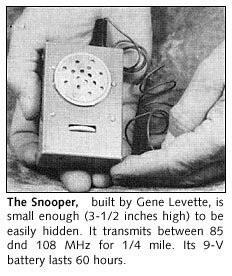 Over the past few years the telephone has become more popular for eavesdropping than the bug. The ways it can be used depend on the ingenuity of the expert who wants to move into someone's conference room or private life. For starters, 12 basic ways to tap a phone are describe below with a circuit diagram description prepared by the Communication Control Corp. of New York, a maker of antibugging devices. But when there are no phones, bugs are used. They're very handy for conference rooms, cars and concealed under lapels. 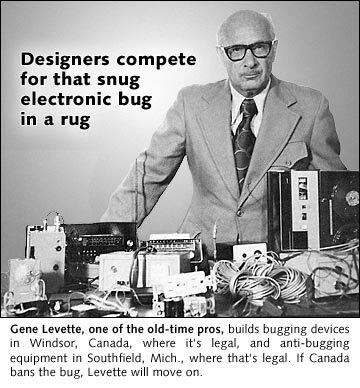 They're all transistorized these days and some even use ICs, although for the most part, "we still don't need all that sophistication," says Gene Levette, who builds bugging devices in Windsor, Canada, where it's legal, and antibugging equipment in Southfield, Mich., where that's legal. Levette also provides a sweeping, or debugging, service to corporations and individuals. The company name in both Canada and the U.S. is the same, Research Electronics. If bugging is ever banned in Canada, Levette says he will set up shop where it is permitted. The frequencies used are relatively fixed. Most bugs transmit in the FM band, just below or above the standard commercial broadcast frequencies -- below 88 MHz or above 108 MHz. 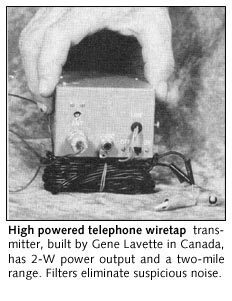 The devices built by Levette operate in the aircraft band between 109 and 114 MHz. The only frequency to avoid is 113 MHz which is used by aircraft for landing in bad weather. Levette sells four different transmitters ranging in power from 99 milliwatts to a 2-W device. If they're used in a room to pick up sound, they're hooked into a microphone. If they're to broadcast a telephone conversation they're attached to the telephone line. And if they're to tail an automobile, the transmitter is packaged with two 14-pound magnets which can be slapped onto the car's gas tank. 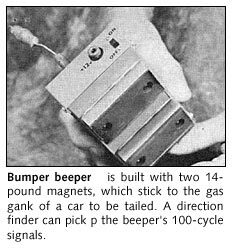 This is called a Bumper Beeper and can be followed by a direction finding receiver. The bugs now available are either untuned or they are crystal-controlled. The ones with crystals are much larger and cost four times as much. Their advantage, of course, is that they don't drift. They are used, however, when they can be concealed - "maybe under a big coat." Bug designers are looking forward to the emergence of miniaturized crystals. 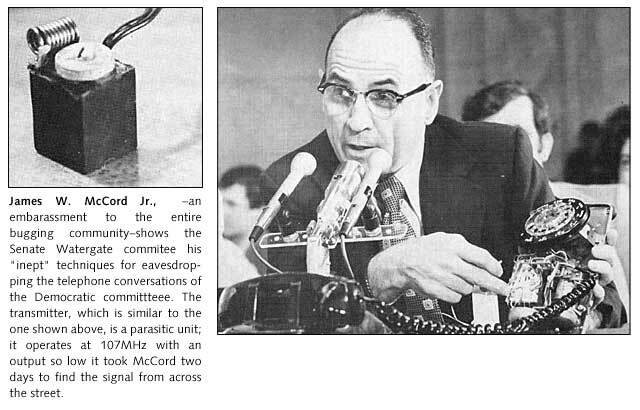 "With such devices we would definitely go to drift-free, crystal-controlled bugs," Levette says. 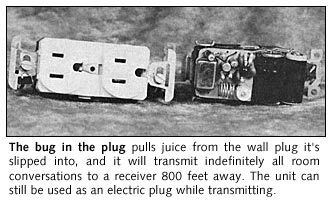 Some bugs use batteries, which last anywhere from 24 to 60 hours, while others are parasites, using the buggee's own 110-V current. If batteries have to be used and the listening room is difficult to enter, a microphone, even a hearing aid, can be planted in the room and wired to a battery outside in a more accessible place. Receivers are not a big problem. Commercial receivers are often bought from discount stores and modified. "We buy Lafayette's very sensitive PB-50 low-band, mobile police radio, which operates between 30 and 50 MHz. By adding a converter and crystal control, we can kick it up to the low end of the aircraft band, 108 to 135 MHz, where it works well with our transmitters," Levette says. To detect hidden transmitters the antibugging expert uses an rf detector that is untuned. It picks up signals transmitted anywhere between 1.75 and 900 MHz. 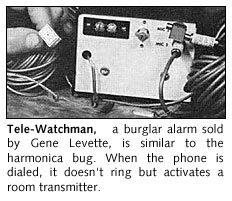 "To sweep a room you extend the telescope antenna of the detector, or receiver, just like that of a transistor radio, and move with it around the suspected area," Levette says. "When the detector begins to squeal you start collapsing the antenna slowly so that it loses sensitivity, causing you to close in on the transmitter. When you're on top of it you start tearing down whatever lies between you and the bug - the wall, ceiling or whatever," Levette says. A good sweep also includes searching the room with a metal detector as well as an rf receiver. "If the transmitters are temporarily off and you give the room a clean bill of health, you look pretty foolish when the bug goes on just before the conference begins," Levette says. Design improvements in bugging devices have not been dramatic but progress has been made. 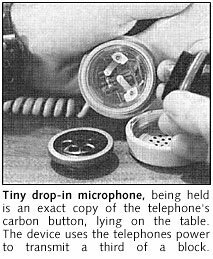 The devices are generally smaller than they were. They are more reliable, less breakable and more powerful. The rf power transistor, for example, has been an important element in new design. It has a resistance in the emitter that makes it burn-out proof in case of antenna mismatch. And with lower voltages no heat sinks are required. Also, with more powerful transistors available now fewer have to be used and the finished product is therefore smaller. Other new developments under way by the bugging community include receivers that are built with FET transistors in the front end and with MOS semiconductors. Some of the equipment uses ceramic filters in i-f stages and ICs in the audio and limiting sections. "We have ICs smaller than a dime that house a complete transmitter - audio section, modulation, everything," Levette says. "All that's needed is a miniaturized crystal. When we have this we will go to crystal control. "Soon, we'll be moving a lot of our equipment to uhf," Levette says. "Why? Because the band is less crowded. We can't do it yet, because we don't have receivers. Also, the antennas are going to have to be very small." Like everyone else, bug makers have joined that ever growing club that wants smaller, more powerful batteries but can't get them. 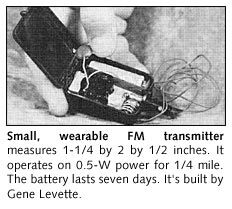 One of Levette's transmitters, already very small, is going to be even smaller in time - "small enough to be worn comfortably in the lining of a coat." How? The coil used conventionally to determine frequency band no longer has to be perpendicular to the unit's base and thus take up an entire half-inch of bulky, eye-catching space. It can now be built on a printed circuit board. Who makes all those bugs? Where do they all come from, those little transmitters and taps? Thin air, according to most reliable sources. Japan? Junk! Europe? Junk! Canada? Yes, very good stuff. The best, however, are made in the U.S. By whom? This is not so easily discovered. It is always custom built, designed, fabricated and installed on a made-to-order basis. This is where the money is, the experts agree. And, of course, these are the orders no one will discuss. They go to government agencies and to individuals being tailed by government agencies. Then there are the fast-buck, mail-order houses which buy from the pros, either in the U.S. or in Canada. Some of these also buy from electronics discount houses and modify the equipment enough to call it their own and double the price. Another source, according to Alfred J. Scotti, Chief Assistant District Attorney and head of the Rackets Bureau in Manhattan, New York City, is the manufacturer of harmless devices, such as guitar amplifiers, which can be used for eavesdropping devices. And then there are the young electronics engineers who build bugging devices for fun and profit. This group even includes the bright high school student who'd rather build his own infinity bug than assemble a color TV. 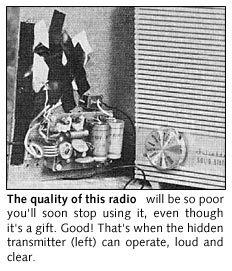 And with components themselves so easy to buy - there's nothing sinister in itself about a transistor - it doesn't look like bugging is about to go away.